We wanted to share Nikita's accomplishment with our families and provide some insight from her parents to help inspire our community. Could you share with us when Nikita started to play the piano and what drew her to the instrument? Nikita started to learn piano as soon as she turned 3, so she has been playing for four years now. She practices on average five day a week and 40 minutes a day, and longer on weekends and holidays, or snow holidays. My husband and I both agreed that piano is the foundation for all other instruments. If Nikita wants to branch out to other instruments, she can do so after she has solid foundation of at least ten years of learning piano. Our piano teacher always encourages collaborate performance, such as duet of piano and violin, piano and vocal, or four hands. If we can find one of her friends to play duet with her for violin, we will try to plan a duet performance in the next recital. You mentioned a connection between precise execution in music and excellence in academics when sharing news of Nikita winning first place in the Rondo Young Artist Award. Can you tell us more about this? There are some sections of a piece that only last 30 seconds but require complex combination of left hand and right hand movements plus paddling, such as left hand playing gradually softer sound, right hand playing gradually louder, right hand playing “phrases,” left hand playing “jumping," taking a quick breath in between sections, left hand taking a 1/16 note break while right hand plays the melody at the same time, etc. It’s super complex on the music sheet for 30 seconds of performance, but to execute perfectly, it can take 6 months or more to practice and achieve that level of perfection. Additionally, excellence in performance requires deep understanding of the piece and how to present that understanding through piano. For example, when Nikita learned "Austrian Dance," we took her to see the Vienna Orchestra which also had waltz dance performance. I explained to her and showed her what “waltz” meant in music, movement, and emotion. You need muscle memories, of course, which are from persistence of practice, but then you also need that imagination to present detailed nuances. 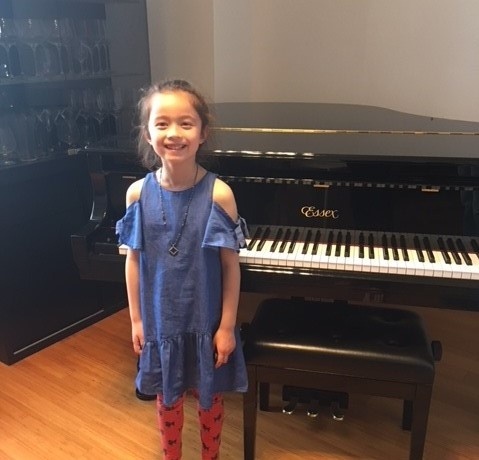 From her competition, some of the judges’ comments were “nuances, phrases, and sounds are amazing.” For almost all the pieces Nikita learned, I have to find a way to let her learn the context and story behind the piece, in addition to daily practice. Those extra things I did made her learning piano more interesting and gave her lasting memories of the piece, not just playing the right notes. I can relate all these efforts of learning piano to achievement of excellence in academics. It is the same discipline to achieve excellence in math, science, or even writing, which all require precision, persistence, and deep understanding of the subjects, then one can apply with his/her own imagination. Who are some of Nikita's favorite composers? Her favorite composers change as she grows more mature, from Bergumullar’s romantic style to Pachelbel Canon, to her current new piece Clementi’s Sonatina, which is technically more challenging, but she loves it. We are not following what many other people do with some kind of rating system to get evaluated every year. We only follow what is the right technique for her to learn at each stage and will be an interesting piece for her. We focus on the quality of each piece’s execution. When does Nikita perform at Carneige Hall and is the event open to the public? Yes. Wednesday, May 2 at 7:30 PM. Tickets ($45/ticket) can be purchased through the Carnegie Hall Box Office, Carnegie Charge by calling 212-247-7800 or by visiting Carnegie Hall’s web site. At the performance Nikita will perform both "Austrian Dance" and "The Mechanical Doll." We hope families will come to the performance and show our community's support. 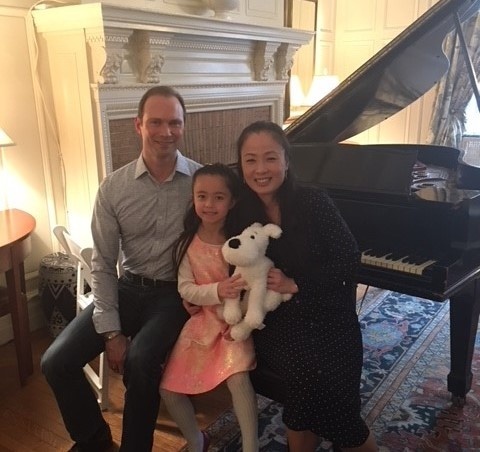 Nikita's mother told us: "It will be so encouraging and exciting for Nikita if some of her friends or teachers can come to see her at Carnegie Hall. I was told most of the time younger musicians will go first, so most likely Nikita will be performing in the beginning. She may well be the youngest in the concert." If you have any stories of student success outside the school that would interest and inspire our community, please let us know!